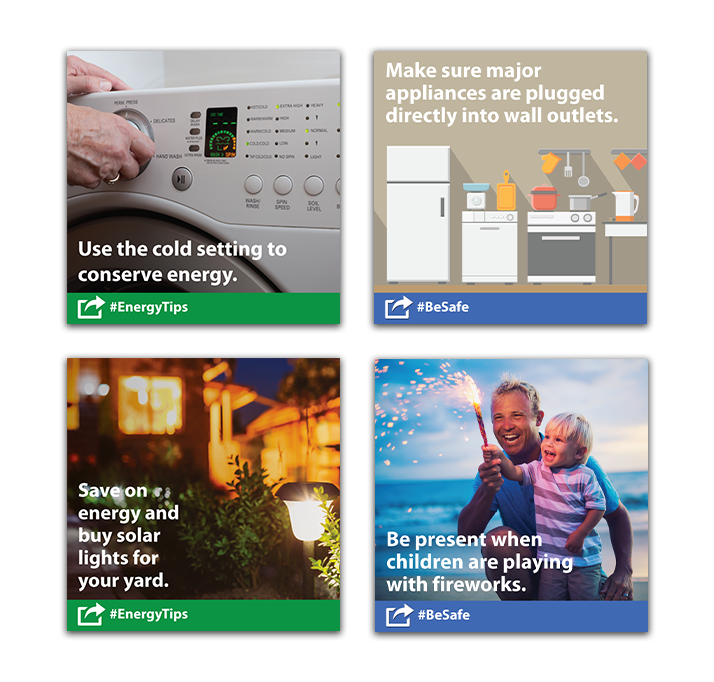 Electrical Safety and Energy-Efficiency Graphics - Ruralite Services, Inc.
Social media posts need eye-catching graphics to stand out. That’s why Ruralite Services Graphic Designer Duy Mai creates electrical safety and energy efficiency-related images every month. Duy works closely Ruralite Services Assistant Editor Ethan Rocke and the Efficiency Services Group team to identify valuable, consumer-friendly topics. Ethan writes tips for utility social media channels, then Duy develops clean images to support the content. Two versions of each graphic are designed, one sized for Facebook or Instagram and the other for Twitter. The graphics are delivered to Ruralite Services’ Social Media Program subscribers. The program provides two graphics every week (safety tips on Mondays, efficiency tips on Thursdays). Want to get fresh industry graphics every month? Subscribe!